Errol’s Angels & Friends, together with Dr Crask & his Swingin’ Elixir band, performed to a capacity house at the Meat Market on Saturday 8 August. 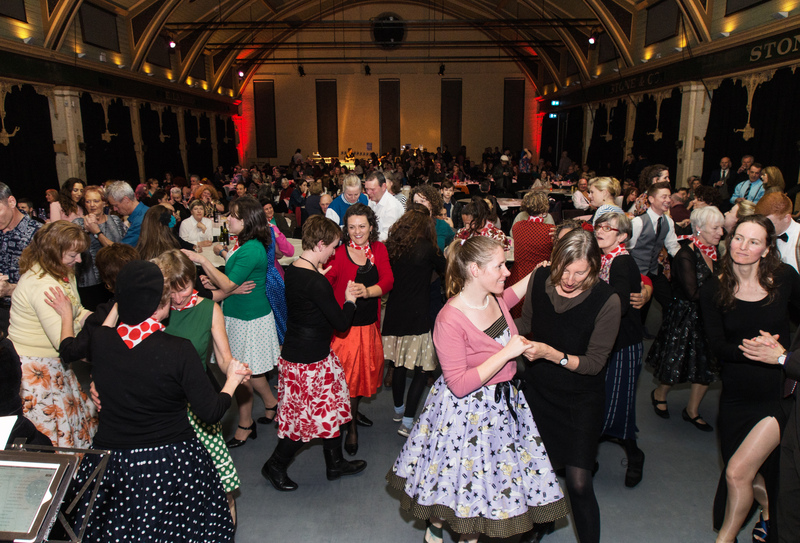 A Night of Swing was held to raise funds for the Asylum Seeker Resource Centre and TrekMedic (Nepal earthquake response). Tickets for the event sold out weeks before. Support from Melbourne City Council through CUTHS funding provided the wonderful venue. On top of this, the generosity of Greg Crask and his band members and Joel, who compered the evening, in donating their time, helped to raise $9436 for the two community groups. Market Lane donated a Coffee Club subscription while ReWine provided a fortified-wine gift pack as a door prize — much appreciated by the recipient, Adrian Jones. The night began with a swing dance lesson conducted by Rosie Michel and Joel, followed by Errol’s Angels Community Choir performing a set of 1930s and ’40s songs. The band had an enthusiastic crowd of young and old up dancing all evening. A buzz of excitement pervaded the event and the Angels received many messages of congratulation.